With the TouchPad, the culmination thus far of HP’s $1.2 billion acquisition of Palm, the world’s largest technology company by revenue hopes it can finally offer a formidable competitor to Apple, the world’s largest technology company by market cap, in the race for tablet dominance. Richard Kerris, the former Apple exec, is gliding through his presentation of HP’s TouchPad. As the current VP of worldwide developer relations for WebOS, the slick software giving life to HP’s latest mobile devices, Kerris is giddily running through the tablet’s bells and whistles: the design, the partnerships, the apps, the engineering. But suddenly our discussion is interrupted by the sound of woodwinds, dancing up the scale. The sound is familiar. It’s the iPhone’s classic marimba ringtone. Only it’s not a song in the distance–it’s coming from my pocket. Marimba or no marimba, there’s no doubt Apple is on the mind of Kerris, and every other exec at HP for that matter. With more than 14 million iPads sold in 2010, Apple has left behind every competitor–from Google to RIM to Microsoft–coughing up dust. But with the TouchPad, the culmination thus far of HP’s $1.2 billion acquisition of Palm, the world’s largest technology company by revenue hopes it can finally offer a formidable opponent to Apple, the world’s largest technology company by market cap, in the race for tablet dominance. And as anyone at HP will tell you, the race is far from finished. Beside RIM, whose BlackBerry PlayBook runs on its own unique OS, nearly all tablet makers have outsourced their software to Google. 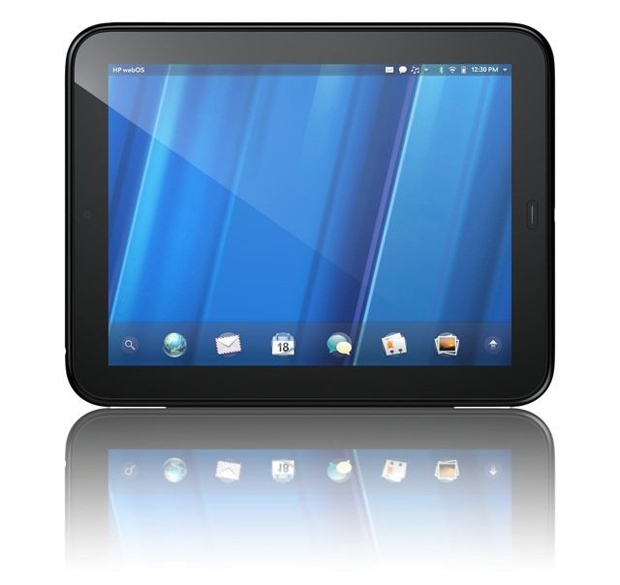 Motorola’s Xoom, Toshiba’s Thrive, Samsung’s Galaxy Tab–they all run on Android, an operating system developed by Google. “There’s a lot of developers on Android that are saying it’s fragmented, confusing–that they don’t know which end is up,” Kerris says. Will HP ever consider selling an Android-based tablet? “We don’t do Android,” McKinney says, flat out. Still, despite the enthusiasm of executives, HP has a long way to go if it ever hopes to catch up with Apple and Android. A recent Gartner study estimates Apple will control roughly 70% of the tablet market by the end of 2011, while Android will grow to a 20% share. Their greatest advantage over HP? Apps. Apple boasts 400,000 apps; Android’s Marketplace has around 300,000. HP’s WebOS, on the other hand, will feature only a few thousand apps at launch on July 1, with just hundreds designed specifically for the tablet itself. “Let me be clear: For TouchPad apps, we’ll have a little more than 300 at launch that are written just for the TouchPad–quite honestly, Honeycomb doesn’t even have the numbers that we’ll have to start,” Kerris says. My conversation with Kerris begins to wind down. Soon he’ll hand me the TouchPad that I’ve been playing with now for the past week. My iPhone, which rang several times during our meeting, was finally set to silent.